All the way back in July we started hearing about OpenFeint and their suite of iOS games that they had hoped to bring over to Android to legitimize gaming on the platform and I’d say they’ve succeeded if you look at these new numbers. Today, after announcing another 14 “chart-topping” games, the total for Feint logo’d titles is up to 315 which is an astounding number, especially when you think that they had just 20 back in September. Included in this new wave are hits like Guerilla Bob, Can Knockdown 2, Ninja Rush Deluxe and Tank Hero; all of which can be found through the Feint Spotlight app or the Android Market. Not bad right? Now, if only we could get them to update the Feint app to include many of the iOS features that make gaming that much more entertaining. Full list of games after the break. April 1, 2011- Burlingame Calif. – OpenFeint has been making key strategic partnerships this year to bring quality games to Android. First, the company announced that it would bring their cross-platform social gaming network to AT&T’s Android devices. Next, the network partnered with The9 and the $100 million Fund9 to help iOS developers port their games to Android. Today, OpenFeint is revealing the latest 14 hit games it has brought to Android. OpenFeint is also releasing some of their game growth statistics. 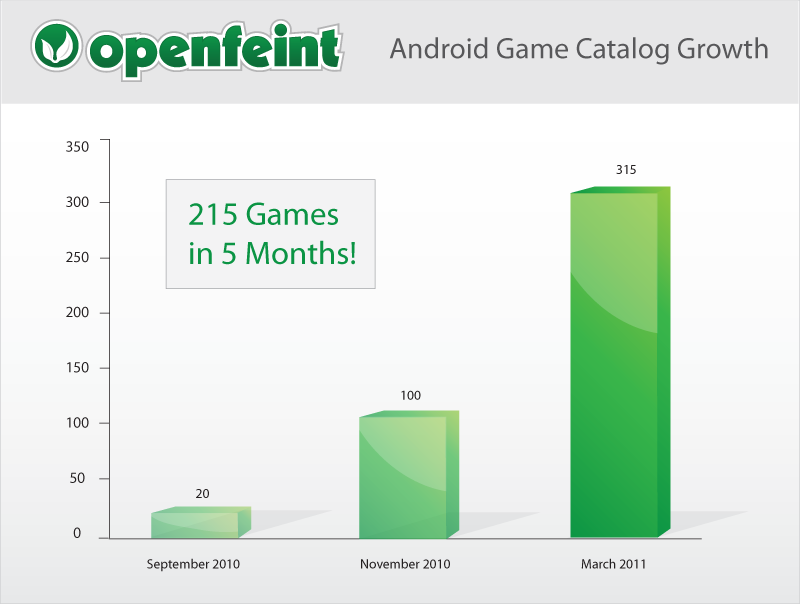 Since November, OpenFeint has added 215 mobile gaming titles to the Android ecosystem, totaling in 315 games. That’s over a 200 percent increase in five months. OpenFeint attributes the significant surge in Android titles to more developers discovering the platform and the benefits of going cross-platform. New OpenFeint titles out on Android in March include:· Can Knockdown: 2 Infinite Dreams· Doodle Bowling: GameResort· Grave Defense Silver Free: Art of Bytes· Guerrilla Bob: Angry Mob Games· Meganoid: Orange Pixel· Ninja Rush Deluxe: Feelingtouch Inc.· Pyxidis: Hyperbees Ltd.· Return Zero (BETA): We came from Mars· Snail Mail for Android: Sandlot Games· Speedx 3D free&full: Hyperbees Ltd.· Stellar Escape: Orange Agenda· Stupid Zombies: GameResort· World Series of Poker Hold’em Legend: Glu· Tank Hero: Clapfoot Games. Now with over 73 million users, OpenFeint’s growth is a global phenomenon. Android users are playing its games in 214 countries. North America represents the largest audience, but the network is rapidly growing its presence in Asia. Developers interested in using OpenFeint in their games should visit OpenFeint.com/Developers for more information. OpenFeint is the largest mobile social gaming ecosystem for all app stores and mobile devices, with over 73 million registered users and a presence in over 5,000 games. OpenFeint is backed by Intel Capital and The9. Developers interested in more information about OpenFeint and its leading mobile social gaming technology should visit OpenFeint.com/Developers.